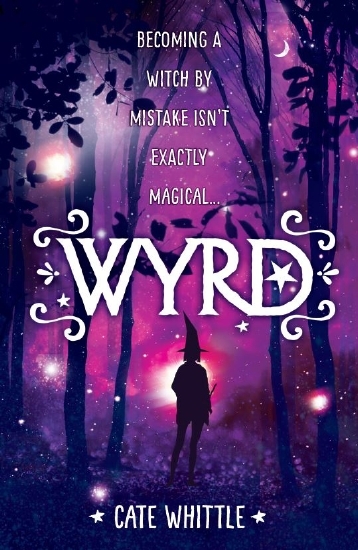 Wyrd is a light-hearted look at the often tumultuous relationship issues that girls in particular seem to face at end of primary school age, and touches on the situation that many children find themselves a part of, with 'merged' families becoming more normal. However, the solution to Emma's problem (finding out that she has magic on her side) is not a solution that could easily be emulated (at least, I don't think so...). Emma has a very different outlook to Pip's, and the pair just cannot seem to get along. This shouldn't be a problem, and it wouldn't be a problem–if it weren't for the fact that Emma's Dad is getting married to Pip's Mum! Soon to be sisters, they find themselves increasingly flung together, but it is not a very happy experience... Pip is determined to make Emma's life miserable. For Dad's sake, Emma tries to keep the peace, but it is a very difficult task. That is, until a book of spells and wishes finds its way into the household, and she accidentally becomes a witch in a secret ceremony intended to impart magical powers to Pip and her friends. Emma is horrified. She never wanted to be a witch, and there seem to be a lot of difficult responsibilities attached to the job. Pip isn't too pleased either–it was meant to be her. I was born far, far away, in Nigeria, a country in West Africa, where my father was teaching, but I only lived there for a few months before my parents moved back to England where I lived in Cornwall, Dorset and Shropshire before we came to Australia. I now live on a beautiful bush block not far from Canberra, surrounded by trees and lots of wildlife. I went to many schools ... starting in Bridport, in Dorset, England, then a school in Libya, then St Augustine’s in Weymouth, followed by a couple of schools in Shropshire (a tiny village school just down the road from the farm where I was living in Minsterley, then a gorgeous old school on the Town Walls in Shrewsbury...) and eventually I went to high school in Kiama on the NSW South Coast. I loved changing schools all the time and going to new places and meeting new people, but I didn’t like high school much. Not really ... there was a boy at my high school who was very rude, though and he had a nickname for everybody. Hmm... I think that in primary school I used to be a bit of a teacher’s pet. I suspect that I was also a bit precocious, but I was always well-behaved. I loved reading and writing, but I also loved to play sport. I changed in high school, where I became pretty quiet, and spent a lot more time in the library. I still did sport, but mostly out of school, because they didn’t ‘do’ the sports I liked at school. Gosh! I was NEVER naughty! I did used to daydream a lot, though, especially in maths classes. I have heaps of favourite books, and I always did, but I totally fell in love with The Lion, the Witch and the Wardrobe by C.S. Lewis and read it over and over (along with the rest of the Narnia books). I’m still hoping to find that wardrobe one day. Ooh, this is a difficult question, because I enjoy reading so many different books and authors. My favourite author is Terry Pratchett and I love his books about Tiffany Aching, a series about a young witch that was written for children. My favourite picture book EVER is Magic Beach by Alison Lester and I very much admire Kate Forsyth, and the amazing Jackie French ... no, this question is too hard, I can’t answer it. I’m really not very good at favourites... My favourite food, though, is probably potatoes in any shape or form, I just love potatoes. My favourite colour is probably blue — you know, that deep, deep blue on the horizon just as the sun has finally disappeared for the day, but before the stars come out. And my favourite movie? I think I’ll say Brave, because I just love a stories about feisty red-heads who are good with a bow and arrow! I can’t remember who inspired me to write, but I’ve wanted to be a writer ever since I can remember. I could read long before I started school (I had my own library card when I was four and I even signed for it myself), and I think that I just wanted to make my own stories even then. I played lots of imagination games when I was little and started writing them down as soon as I was able. So ... it was probably my Mum, who taught me to read, and always encouraged me to write (she still does!). Really, I just wrote. And wrote. I wrote stories and poems and journals and letters. I eventually wrote a novel, which I sent off to a publisher — it was very bad — and they sent me a rejection letter and I realised that I still had a lot to learn, so I did some courses and joined a Writers’ Centre and then I started entering competitions. I did pretty well, and had some stories published... then I wrote a couple of stories and articles for magazines and eventually my stories about Trouble found a home with Omnibus. I had a poem published when I was thirteen. It featured cobwebs and death and all sorts of dreary things. I was reading lots of gothic novels at the time and I had just fallen off a horse and broken my wrist, so I was feeling very dark and grim. There was a long wait after that — until I was over forty — then I wrote a story called 'The Garden', about magic and mayhem, not gardening, which was published in an anthology and I got really excited. I had to do something with all those stories rolling around inside my head! Some of the characters were very insistent. Also, I just love playing with words. I’m very lucky, now, because I have a room with a view out over my back garden to the bush that surrounds my house, but I have written in many different sorts of places. I used to lie on my bed to write when I was growing up, or curl up in a big armchair in the front room. Or, sometimes, at the beach, on cloudy days with the wind blowing my pages closed. I get to go on some amazing adventures (mostly inside my head, but I did get to go on a real adventure to meet Terry Pratchett a couple of years ago). I get embarrassed writing about myself. I’m both a mum and a teacher, so I do Mum and Teaching things when I am not writing. I also love to read (I find it very hard to put book down once I have started reading) and I like to potter around my garden, although I’m not very good at gardening, and go walking. I also like going places and seeing new things and I’m very interested in medieval history. Well, I became a teacher, and I love being able to help children learn, but I would also have loved to have been a landscape investigator, which is a kind of an archaeologist, or a gardener, or, maybe, worked with horses if they didn’t make me sneeze so much. I sometimes dream about having my own little bookshop, full of all my favourite kinds of books, with a little cafe and maybe a tiny garden where people could sit and read, and famous authors could come to visit and talk about their books. Lots of them! I’ve always been intrigued by Emma of Normandy, who was married first to King Ethelred, and then to King Cnut... it was a pivotal time in English history, and she seems to have been a strong and intelligent ‘player’. I’ve always imagined her as a feisty red-head who was good with a bow and arrow. Or, perhaps, Shakespeare whose writing is so lyrical and beautiful, plus he invented loads of great words. I like rainy days and stormy seas. My favourite season is autumn. I enjoy playing in the snow. I love the feel of sand between my toes and the sea brushing around my ankles. I don’t like it when people are unkind to each other and I hate rice pudding. And I have a cat called Max, who is really the evil ruler of the universe (just ask him). My current website is www.catewhittlewrites.com and I have a blog attached to the website, but it is really written for other writers. I’m planning on developing a different website/blog for readers, but I haven’t got there quite yet. I’m hoping that I’ll have a launch page coming soon.